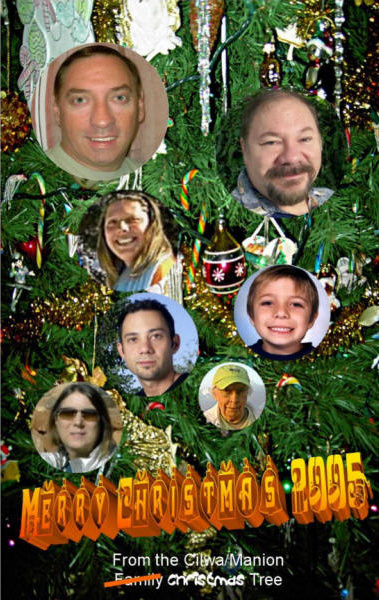 The Cilwa/Manion&apos;s 2005 Christmas Letter. 2005 was another wild wide for the Cilwa/Manion clan. We began the year with Michael attending Glendale Community College as a sophomore, and Paul underemployed at Best Western, still trying to find a position that would make appropriate use of his skill set. Daughter Karen, ex-wife/friend Mary, and grandson Zachary rounded out the household. Paul’s Mom, Edna Mae, returned home after a short visit to his sisters in Florida in March. That was expected. But the month before, our son John returned from Iceland, after trying for several years to deal with his increasingly irrational spouse. His son, Max, remains in Iceland, it being very difficult to sue for custody from another country. In the Spring, Michael, who was on GCC’s President’s List, graduated with an Associate’s Degree in General Studies and immediately began attending Arizona State University as a junior in August. He is working towards his bachelor’s in kinesiology. Karen also attends ASU, but so far their schedules have not been congruent enough to permit carpooling. Karen is working toward her bachelor’s in archaeology. She’s been making A’s and B’s in all her classes. In September, Michael’s niece Dotsie and her partner, Dale, came all the way from Connecticut for a visit. We stayed at their time-share in Sedona and showed them the various trails and vortexes and gift shops. All four of us had a great time. In October, Paul finally landed a decent contract that places him at Toyota Financial Services in Chandler. That’s even farther from the house than ASU, so we both drive in together and still wind up spending all our money on gasoline. Our December good news was that John got a job in his field as a graphic artist. So, with Mary intending to start college again in the new year, we’ll all be occupied in some full-time fashion and that’s always a good thing. 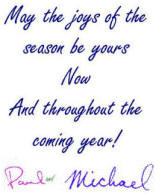 We all hope your year has been filled with joy and that the coming year is twice as much so.